Jan Hojer sticking the cruxy first move on MF1. 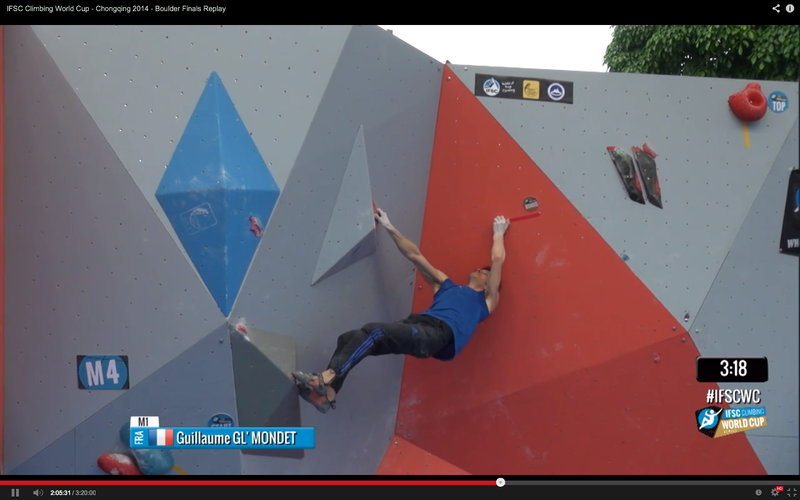 This problem started with a one-two-three dyno that crushed souls and took Jan 800 (ok, really 14) tries to stick. Once he stuck it he went to the top. 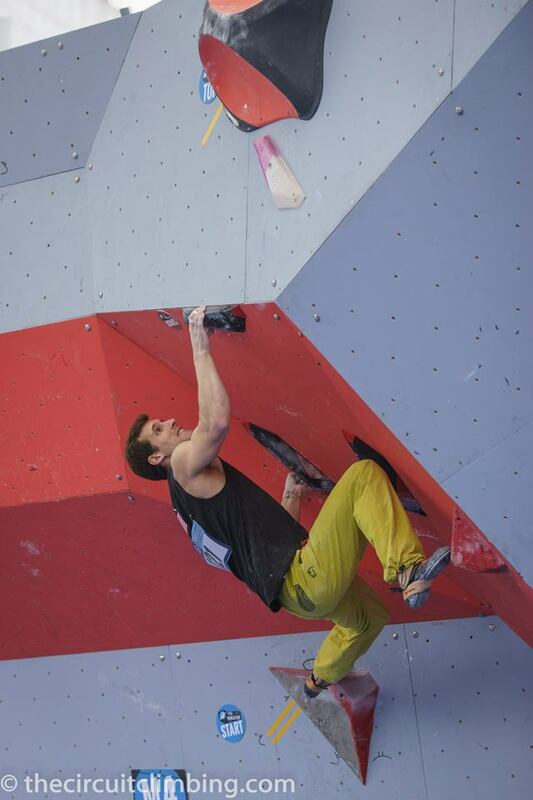 The only other male to finish the problem was Dmitrii Sharafutdinov, who did it his 3rd try. 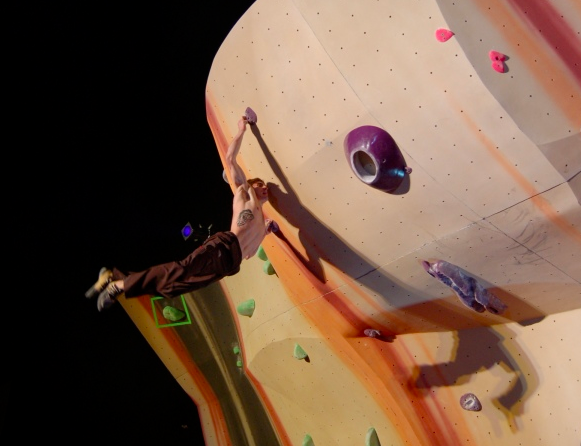 The route setters indulged themselves with the right side of the wall and the volume array made up Women’s Final 1 and Men’s Final 3. 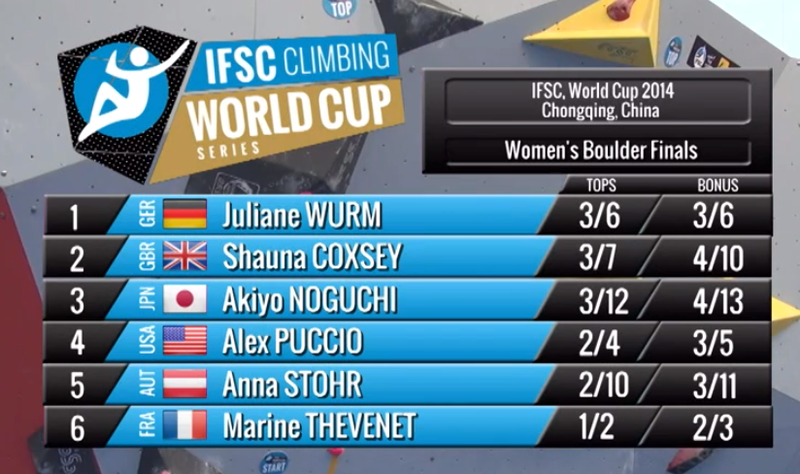 Shauna Coxsey near the top on her flash. Shauna, Jule, and Akiyo came out and more or less hiked this thing. 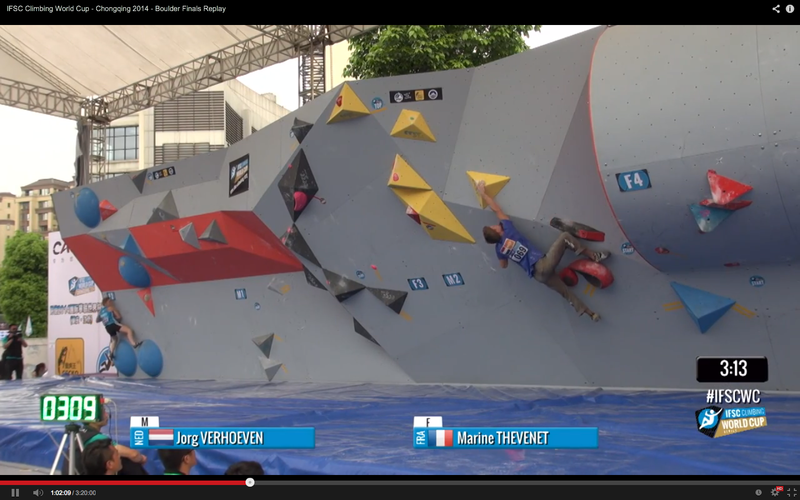 Puccio, Anna Stohr, and French climber Marine Thévenet got bonus but couldn’t get around the top. In the picture the last hold is at the top left corner of that top triangle, and apparently it was a bit hard to hold on to and work around. Leftward trending triangle volumes. Yellow. 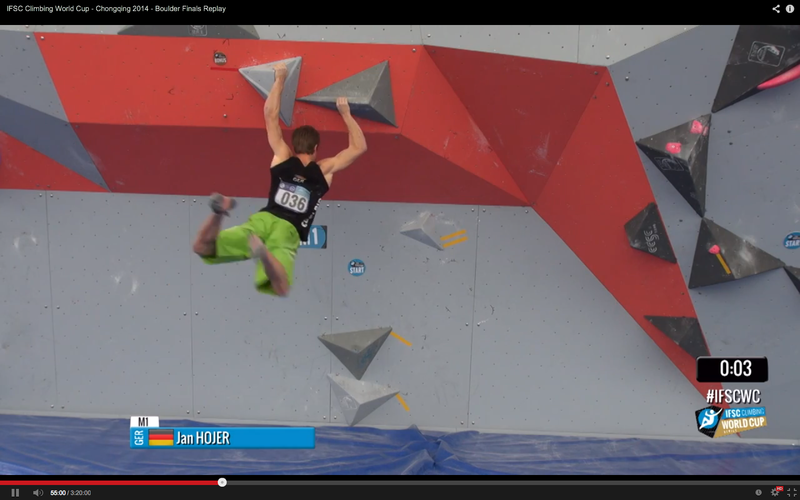 This was the easiest of the men’s finals, and seemed relatively straight forward sequentially. 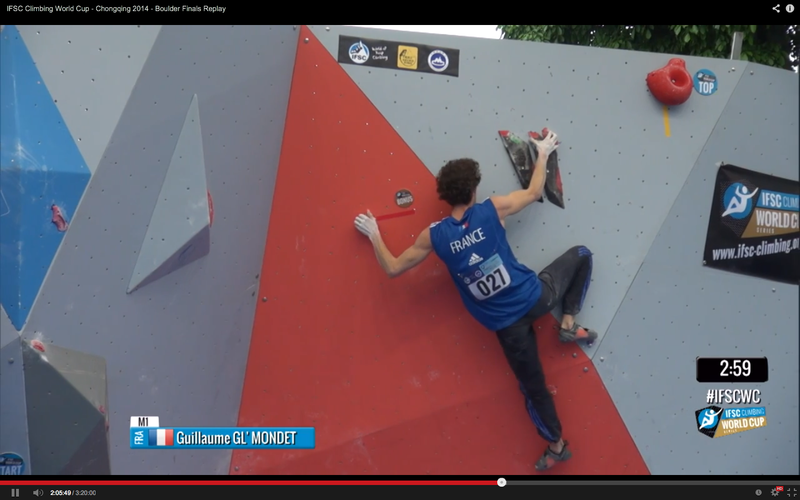 It got 2 flashes (Dmitrii and James), 2 2nd-go sends (Jan and Jorg), and one 3rd go send (Guillaume). Vadim didn’t get bonus. 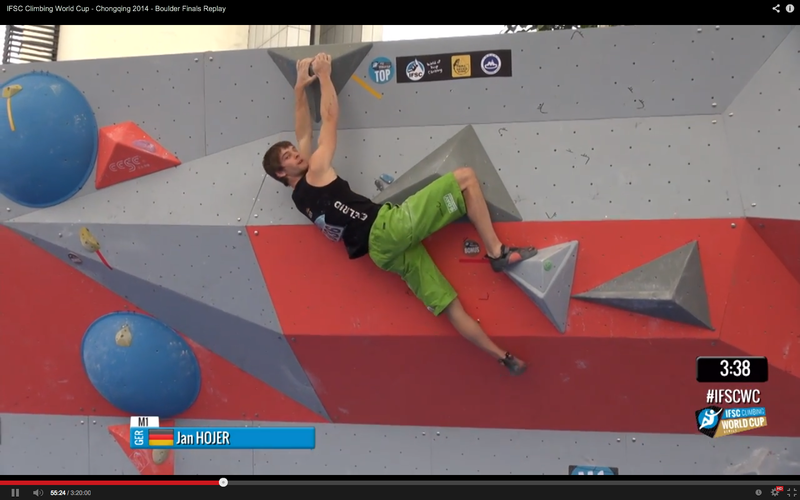 Jorg out for a walk on Men’s 2. Like the men’s cruxy first move on the first final, the women’s second final had this crazy cross-jump thing at the bottom that stood in everyone’s way. Once they stuck it, they sent. Marine sizing up the jump. She didn’t end up sticking it. Alex trying to stick the cross-jump. She didn’t finish this one. 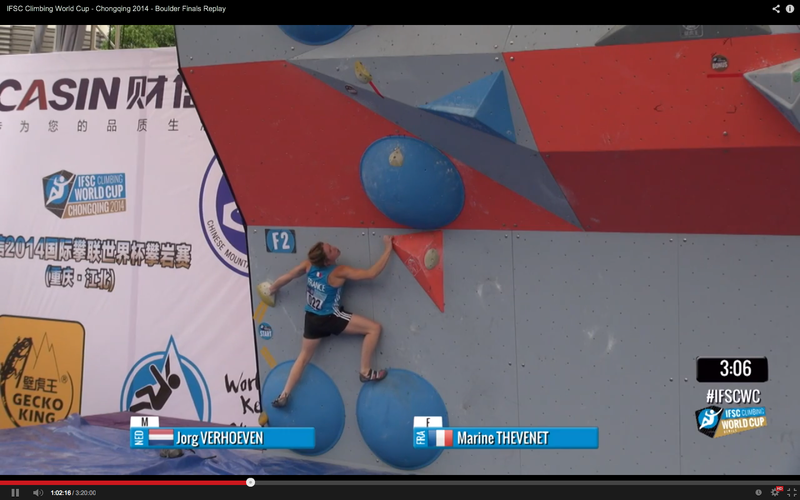 Jule at the top of Women’s 2. She did it 4th try. 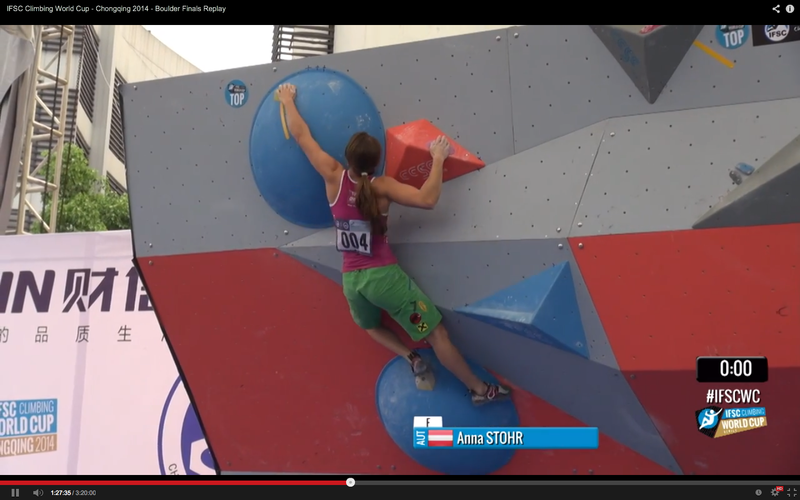 Shauna did this 5th go, Akiyo 10th go, and Anna 9th go. Another cruxy party trick problem with few sends. The counterpart to Women’s 1. Dance left, jump with a leg kick to catch the left-facing volume GG is staring at here. Jan did it 8th go, Jorg did it 7th go, no one else even got bonus. 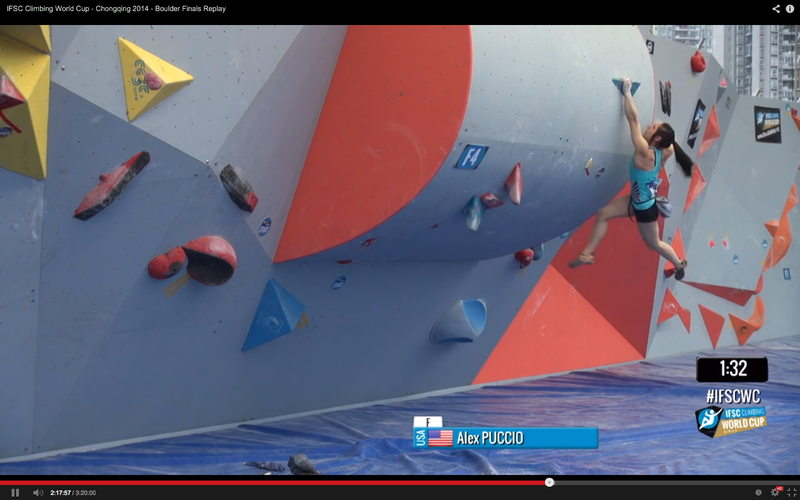 I don’t have a good shot of this one and it was the easiest women’s final and wasn’t very interesting. Pink holds that looked decent up some triangles. Everyone did it, and everyone flashed it except Marine who did it 2nd try. Balancey powerful moves up volumes, a big cross to bonus, more delicate looking moves across some jibs and small volumes, a sloping dish for the finish. 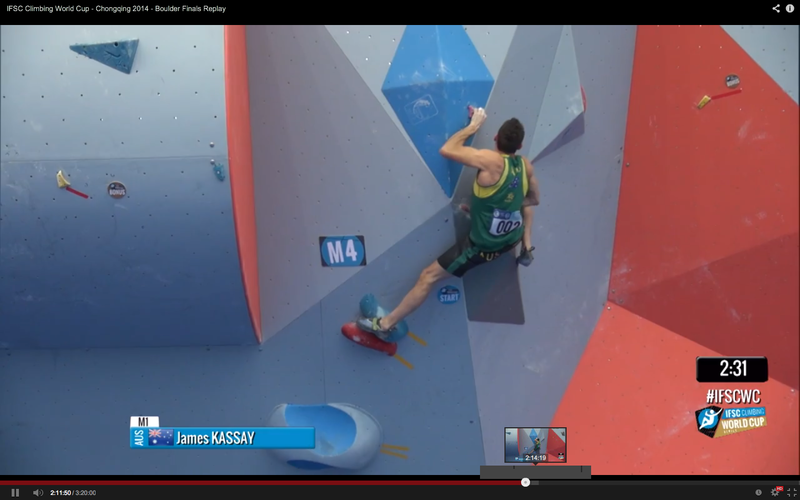 James did well on the bottom but didn’t get to the bonus. Neither did Jorg or Vadim. Guillaume in the middle of his near-flash. Instead he fell on the last hold when he moved too quickly and swung off the not-jug. He didn’t end up finishing. Bummer. 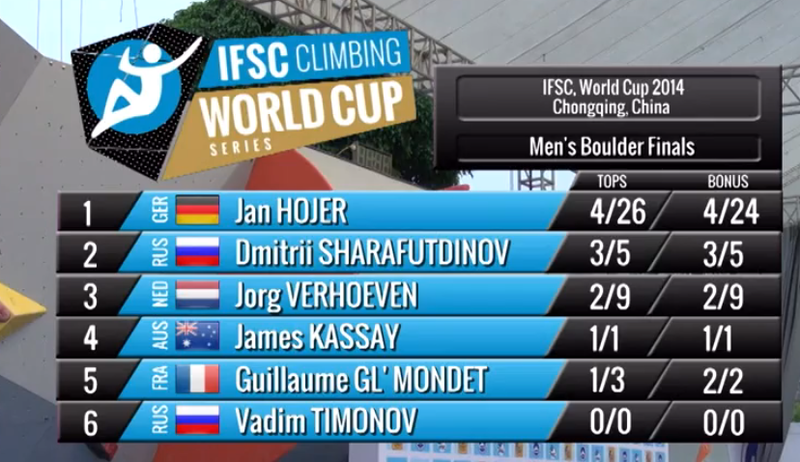 There was some success on this bolder though, Dmitrii flashed and Jan finished 2nd try. 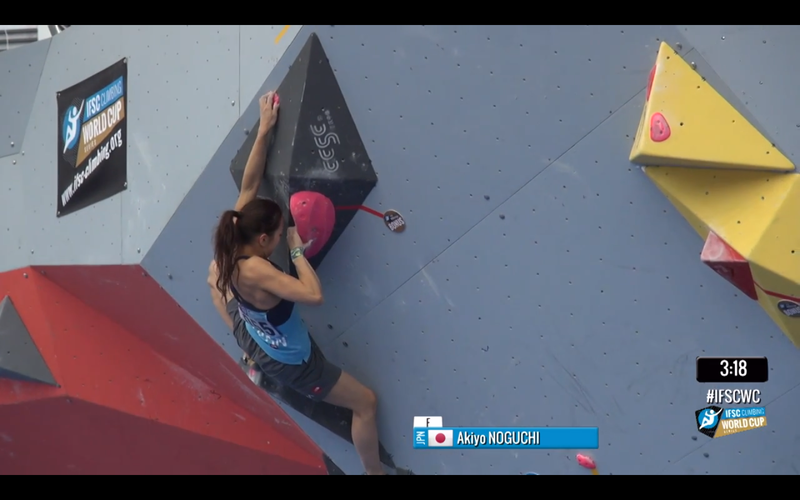 A couple of powerful moves right out a roof with some big underclings, then a thrutch to the bonus which only Shauna, Alex, and Akiyo stuck, then a huge move to the next blue triangle, a small jib/mantle, and the top. 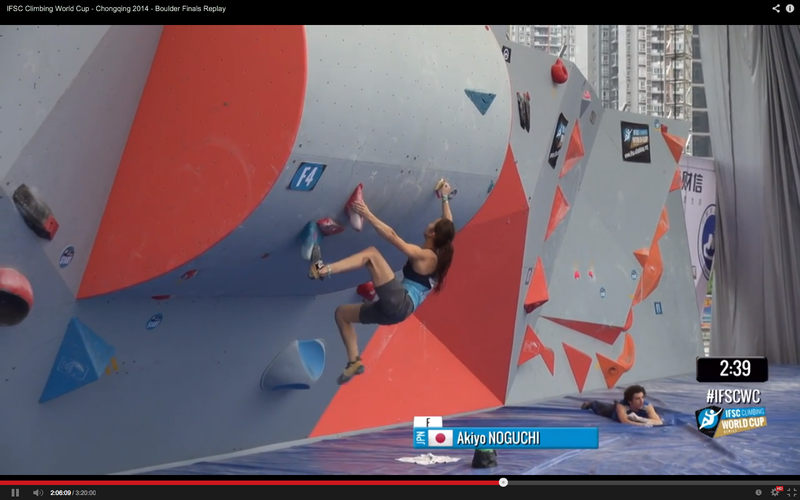 Akiyo with her right hand on bonus trying to figure out how to do the stopper move. 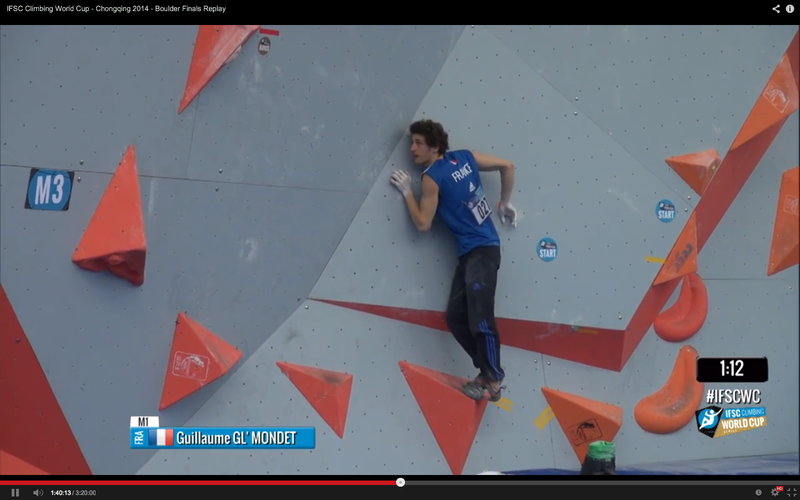 You can see GG on the mat right after falling from the end of Men’s 4. 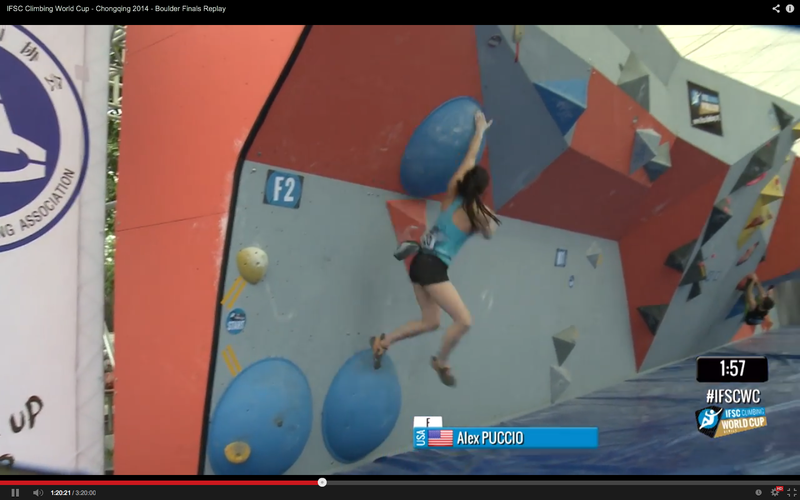 Alex becoming the only woman to stick this move and make the only send of Women’s Final 4. All three to get here tried toehooking/heelhooking but Alex quickly gave up on that and just jumped. Alex about to mantle to the top. 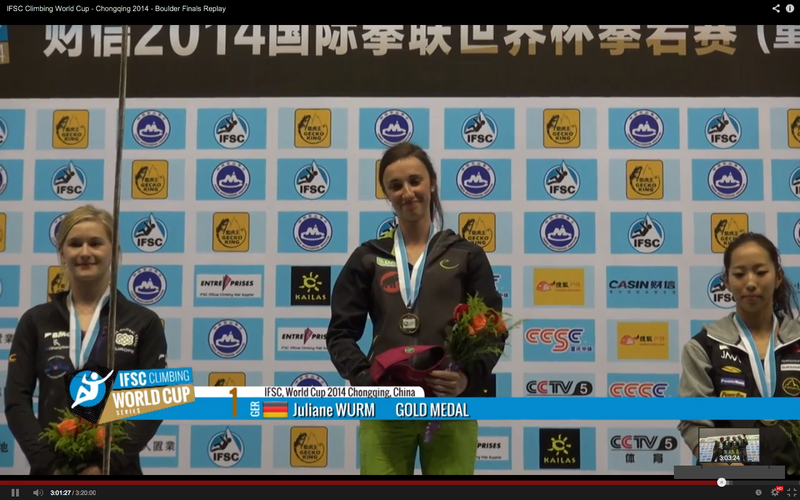 You can see more media on Facebook and also follow the World Cups in general via The Circuit World Cup Magazine. 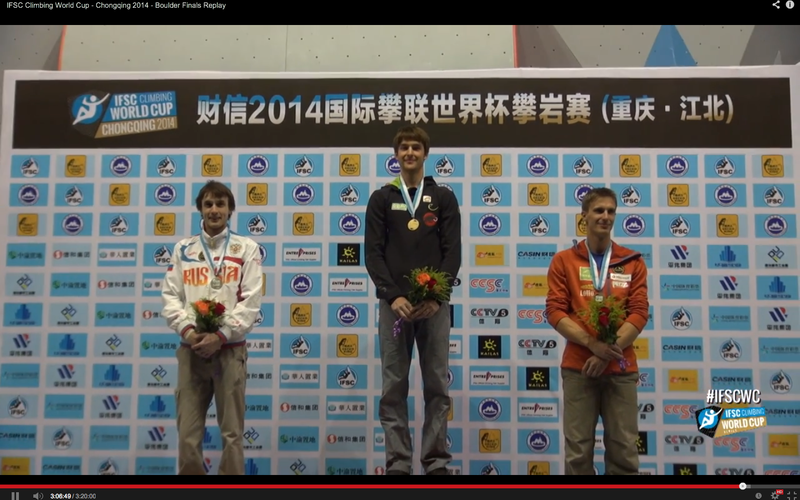 Finally, here’s a picture of our setter Joel Zerr competing in qualis in China. It was his first-ever World Cup and he got 30th. Nice job Joel!!! 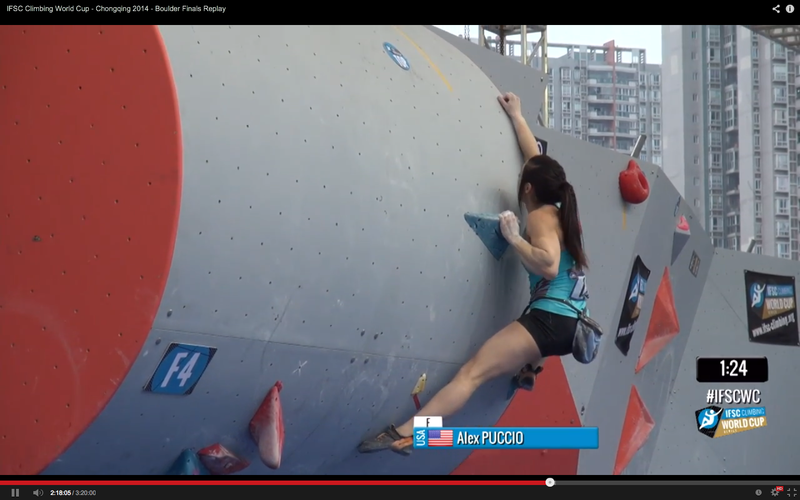 2014 IFSC Bouldering World Cup #2 – Baku Do you see?? ?